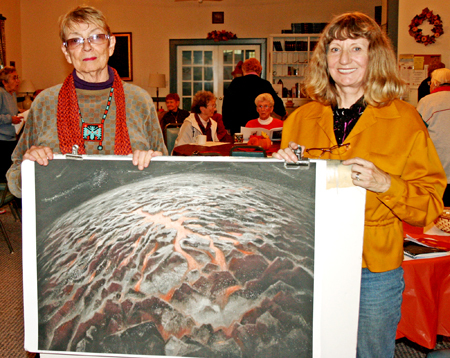 Island artist Janet Culbertson was the guest speaker at the Shelter Island Women’s Community Club luncheon on November 13 in Fellowship Hall at the Presbyterian Church. The slide show of her work addressed the physical, biological and chemical factors affecting the world. Using mixed media — collage, paints, metallic powder, glass chips and other materials on various surfaces — her paintings speak to her 40-plus years of concern for the environment. Her message for the WCC audience created some unease but raised the group’s consciousness about what the earth looks like now and could become if the ravaging of the landscape continues. Ms. Culbertson’s paintings are in the collections of a number of museums, among them Guild Hall in East Hampton, the Islip Museum, Heckscher Museum of Art in Huntington, the Nassau County Museum of Art in Roslyn Harbor and the National Academy of Sciences in Washington, D.C. Her work can be seen at her Island studio during the year or viewed on her website, janetculbertson.net. “Shelter Island: Art + Friendship + Discovery,” a 77-minute film, tells the story of Island “Outsider” artist Harald Olson, his gallery at O’s Place and his friendship with gas station owner Jimmy Olinkiewicz. It will be shown at the Hamptons Take 2 Documentary Film Festival on Friday, November 30 at 8:15 p.m. The three-day festival, now in its fifth year, will be held at the Bay Street Theatre in Sag Harbor. Tickets cost $15 for each film; $100 for a festival pass to all the films; tickets can be purchased at the Bay Street Theatre box office (725-9500) or online at ht2ff.com. The documentary, directed by award-winning filmmaker Michael Canzoniero, has been shown at six film festivals and this month was named the best biographical documentary of the year at the ArcLight Cinema Film Festival in Hollywood. That award will probably qualify the film for Academy Award consideration, Mr. Canzoniero said this week. “Shelter Island” will have its New York City premiere in the near future. This is a real Island story. Mr. Canzoniero was visiting his in-laws on Shelter Island, Tom and Marjorie Melley, a couple of summers ago when his father-in-law asked if he would like to see the art gallery his friend Jimmy Olinkiewicz had built onto his gas station for Harald Olson, a self-taught abstract artist from West Virginia who came to Shelter Island, by way of logging camps in Alaska, in 2003. Islanders can get a sense of what that journey was all about by watching the film’s trailer — a two-minute introduction that opens with Harald bicycling into the Recycling Center, announcing “Here it is, the shopping mall,” and finding materials and paint for his work. “I can see abstract art in a lot of things,” he says later and the viewer begins to see it that way, too. Visit “Shelter Island movie Harald” online for a preview. 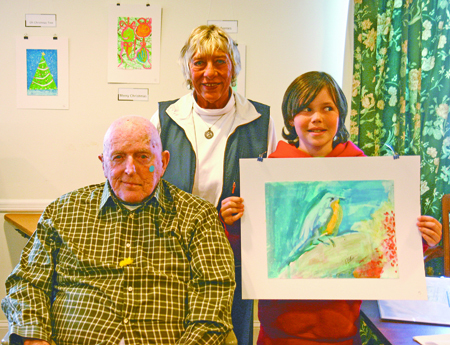 Bud Fox’s watercolors went on display in Town Hall this month and a reception honored the Island artist on Friday, April 13. His paintings were on sale for $50 each, with the proceeds benefiting the Make-A-Wish Foundation. Olive Reich's 'Corporate Meeting,' on display at Johnson & Johnson's corporate headquarters in New Jersey. Heights artist Olive Reich’s painting, “Corporate Meeting,” is on exhibit in a show called “HERstorically Speaking” at the Johnson & Johnson World Corporate headquarters in New Brunswick, New Jersey. 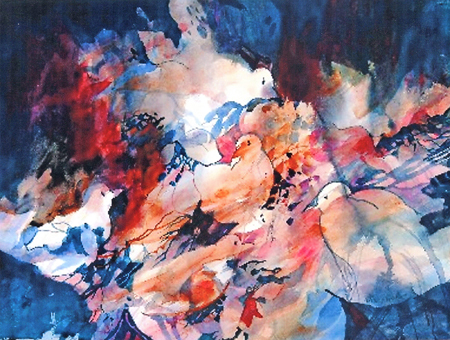 The show will run through May 25 and is part of a series of exhibitions throughout the country sponsored by the National Association of Women Artists. Island artist Stephanie L. Franks’ work will be featured in the Bowery Gallery’s exhibit, “Locked Into Place by Line, Form and Color,” opening on Tuesday, April 24. The show will run until May 19. The artist-run gallery is located in Chelsea — 530 West 25th Street, 4th floor. 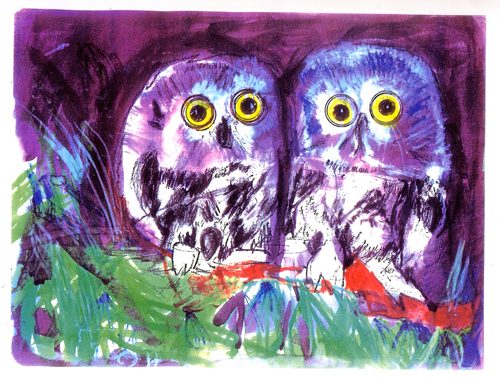 An artist’s reception will be held on Thursday, April 26 from 5 to 8 p.m.
‘Owl Twins’ by Bud Fox. “Walt Whitman: Songs of the People” will be presented in celebration of National Poetry Month at the North Shore Public Library in Shoreham on Saturday, April 14 at 3 p.m. There is no admission charge. The North Shore Public Library is located at the intersection of Route 25A and William Floyd Parkway.